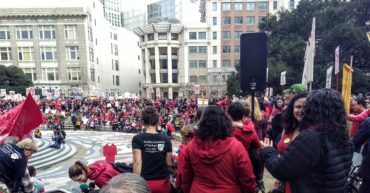 Oakland teachers are ready to strike. We hear voices from the Defend Education march and rally on Saturday. From Making Contact: a look back at a few of the gender and human liberation warriors we lost last year, including Japanese American researcher Aiko Herzig-Yoshinaga, Brazilian LGBT and feminist activist politician Marielle Franco, LGBTQ and prison activist Ray Hill; Burmese indigenous environmental activist;Saw O Moo, Kiilu Nyasha, Black Panther, feminist activist and radio host; and acclaimed radical novelist Ursula Le Guin. And from Radio Curious, Christina Amestad Aanestad interviews Caleen Sisk-Franco, the Spiritual Leader and Chief of the Winnemem-Wintu tribe in Northern California, about ancient puberty rites for young women which the tribe resurrected a few years ago, after not performing it for 80 years. The forest service refuses to grant the tribe private access to their ancestral land along the McCloud river, because they are an “unrecognized” tribe, but the tribe realized that if they did not figure out how to bring back the ritual, it will be lost as the oldest members die out. Tune in Monday at 1:00 pm on KPFA 94.1 FM or online anywhere at www.kpfa.org. Or check out our blog kpfawomensmag.blogspot.com to hear it in our archive.